ZOMG! It’s 2017 already! It’s time for me to start getting my adventure list ready for 2017. Although I will be jumping back and forth between Miami and Cuba, I have some destinations that take me to NEW places as well. One of those destinations is returning to Africa, but to a new country this time, Ghana. As I’m not an expert, I have enlisted the help of peer travel writer and adventure lover, Hannah Stone. Enjoy getting a sneak peek at Ghana with Hannah! Located on West Africa’s Gulf of Guinea, Ghana is known as the golden child. This is due to its rapid development and stable democracy. With its beautiful beaches, rich culture, energetic cities, and diverse wildlife, it provides a comprehensive introduction to Africa. Ghanaians have a reputation for their warm and friendly nature. Rightly proud of their beautiful country, they will provide you with a warm welcome and introduce you to their traditions and culture. One of these locations is Africa and a lesser known gem, Ghana. However, I’m not the expert. 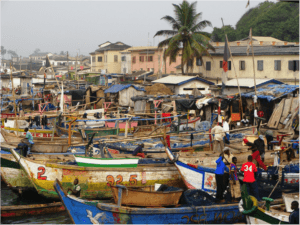 Take a peek at what Ghana has to offer with this article written by Hannah Stone, a peer travel writer and adventure lover. Located on West Africa’s Gulf of Guinea, Ghana is known as the golden child. This is due to its rapid development and stable democracy. With its beautiful beaches, rich culture, energetic cities, and diverse wildlife, it provides a comprehensive introduction to Africa. Ghanaians have a reputation for their warm and friendly nature. Rightly proud of their beautiful country, they will provide you with a warm welcome and introduce you to their traditions and culture. The climate of Ghana is tropical. The eastern areas are warm and fairly dry, whereas the southwest area is hot and humid. Make sure you pack accordingly. There are many ways to experience Ghana. One of the areas that has been growing steadily in popularity is volunteering. People from all over the world and all ages volunteer in Ghana. They provide a range of useful services including teaching, working with children, working in parks and reserves and in health care. In return they receive the experience of a lifetime. Around the coast of Ghana, you will notice a number of ancient castles and forts. These are living relics of the ancient slave trade. Slaves were held in these castles before being shipped across the ocean, never to return to their homeland. Cape Coast Castle and Museum is one such example. The museum provides detailed information on the history of the slave trade in this area and provides many exhibits, including a replica of a ship’s hold and auction blocks. Music is an important part of Ghana’s culture. You can’t escape it, and you wouldn’t want to. Wherever you travel, you will hear the energetic rhythms of the drum beat. A djembe is a skin-covered drum played with the bare hands. This will become the welcome soundtrack of your holiday. Ghanaians are among the friendliest people in the world and will offer you a warm welcome. Greetings are extremely important, and this is something you should be aware of if you don’t want to cause offense. Expect complete strangers to ask you, “Eti sen?” (how are you?) You will also become familiar with the word, oburoni. This means foreigner and will be shouted at you countless times each day. However, it isn’t meant to be offensive. It’s a friendly greeting and a way to get to know you. Imagine listening to the sound of the Ghanaian drum beat as you doze on a soft, sandy beach. Or listening to the sound of the singing fishermen as they gather their nets. This is what you can expect from the Ghanaian beaches. Labadi Beach is known as a pleasure beach. Its strong winds make playing soccer, volleyball, and Frisbee possible. It is also well-equipped with shower rooms, changing areas, and restaurants. If you’re looking for somewhere a little quieter, head out for Alaska Beach, which is popular with backpackers. Whether you enjoy the energy and bustle of the city or the peaceful vibe of the villages, Ghana has them in abundance. Both have their draws, and it’s interesting to experience both ways of life. Beaches, lively cities, rich culture, energetic music; Ghana has all of this and more. If it’s not on there already, Ghana should be firmly on your travel wishlist.